I started PRIMED lifestyle 9 weeks ago. – After 1 week, I lost 7 pounds. – I felt had more energy and I was one hyper girl but not from sugar! – Everyone was complimenting me about how great I looked. – I trained smartly and slept more. Rested when I was tired. – I followed the PRIMED diet strictly towards race day. (From Chad – “Simply meant ate more seafood, eggs, green veg with quality fats like butter, olive oil and Primed Organic VCO. Also meant no toxic veg oil, no soy, nothing low-fat, no poisoned grains and no highly processed carbage). – I was a FAT burning machine! – Only had coconut water, bananas and nuts (almonds, cashews and macadamia) during the race (Cebu half-Ironman). 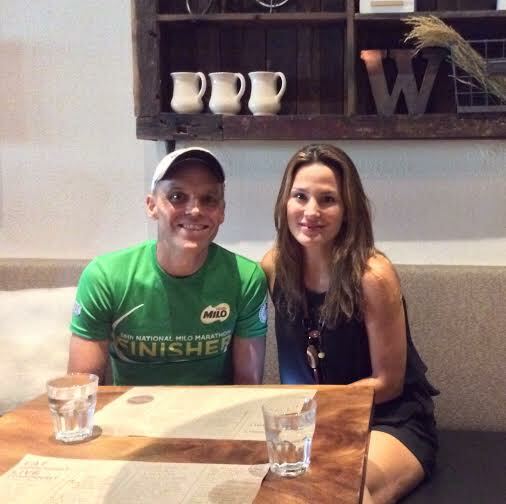 Christian and I had fun talking to the triathlon team of Dolly – the Triads. We enjoyed the Davao lechon, kinilaw and NOT the iced tea or rice. Will the triad team adopt the Primed Lifestyle? The ones who want more from life will. The ones who want to be healthier and happier, like Dolly, will. The ones who think carbo loading is ok, that Sugarade is ok, that excessive training is ok, that grains are real food etc. will not. Unfortunately they will also be the ones who will have less than optimal brains and bodies. Their children too. Not really fair. Why do I care so much? Because their children will eat the same food and have the same drinks as their parents. Children deserve lots of nourishment in terms of love, hugs and food to help their brains and bodies grow optimally. The below statement is sadly true. It does not have to be. Previous PostDanny is Rocking his Primed Life. You can too.Next PostSome Mistruths Exposed from an Australian “Healthy Living” Newspaper Article.